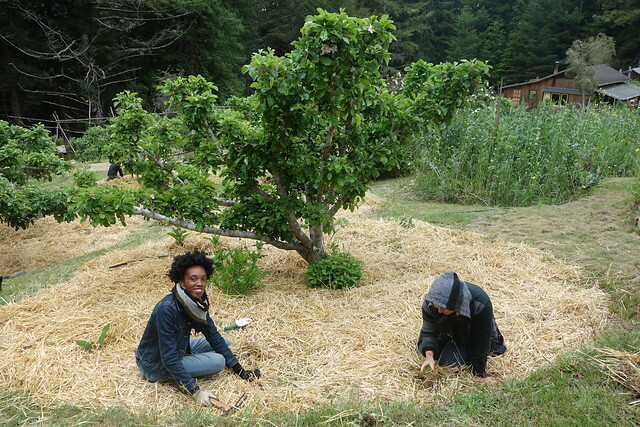 Growing plants and community at Salmon Creek Farm – Sugar vs the Reef ? 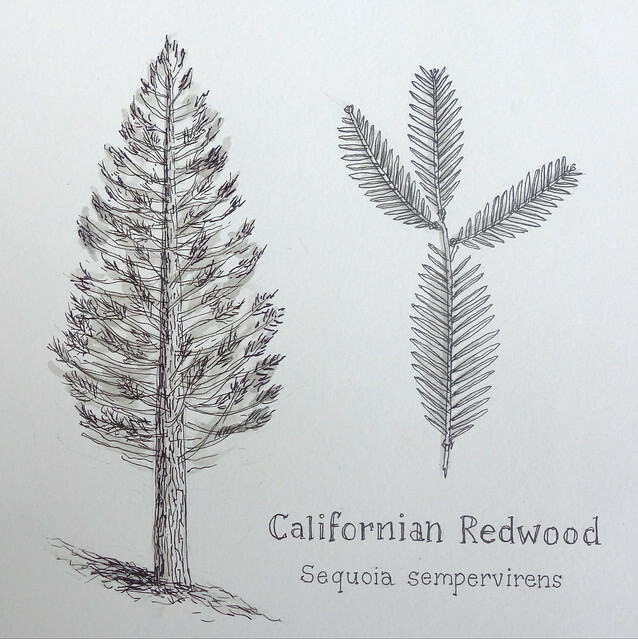 The world’s tallest tree is the Coast Redwood (Sequoia sempervirens). 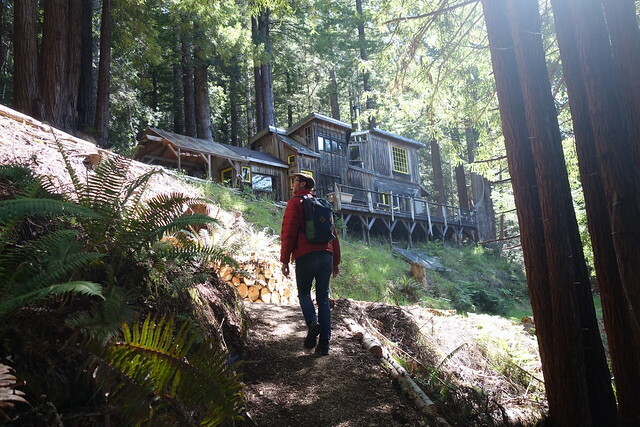 It is indigenous to northern California and during our research trip to California and Nevada in May 2018, we were lucky enough to spend a peaceful three days nestled in a Sequoia forest at Salmon Creek Farm in Mendocino County, northern California. 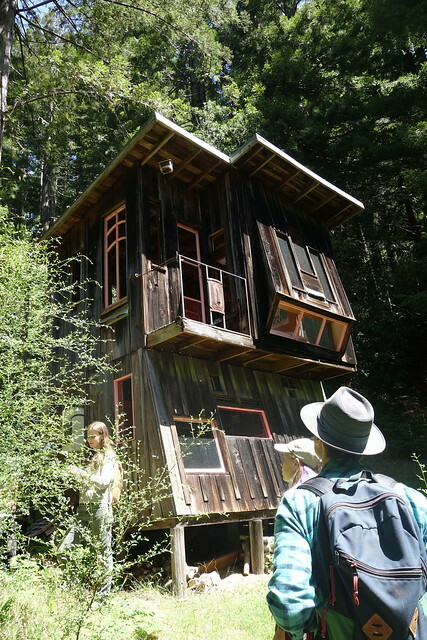 This 35 acre (14 hectare) former hippie commune was purchased in 2014 by artist Fritz Haeg. Fritz’s art practice is multidisciplinary, ranging over dance and performance, ecology, edible gardens, architecture, installation, educational environments and gatherings. Salmon Creek Farm is now his long-term artwork; a piece of land that, with the help of guests, he is slowly tending, nurturing and rebuilding as “a sort of commune-farm-homestead-sanctuary-school hybrid”. Fritz, Alex, Dionne, Nissa and Lucas eating dinner with the fruit and vegie garden at back. Mendocino County is a beautiful part of the Californian coast, a popular wine-growing area and hub of liberal views and small landholders. It is easy to see how the region became a place for people to retreat to in the 1960s and 70s – rolling hills, dense forests and rugged coastline, well away from the big smoke. Today it has a more of a sense of gentrified alternate lifestyles. According to Wikipedia, it was estimated in 2009 “that roughly one-third of the economy was based on the cultivation of marijuana”. One of the original cottages at Salmon Creek Farm. This one was designed by a 12-year-old! “This commune, along with many others in this region at the time, grew out of the student protest culture of the late 60’s, by those disenchanted with the society they were inheriting from previous generations. They were resisting the Vietnam war and general mindless consumer conformity, while promoting issues like civil rights, gay liberation and environmental consciousness. 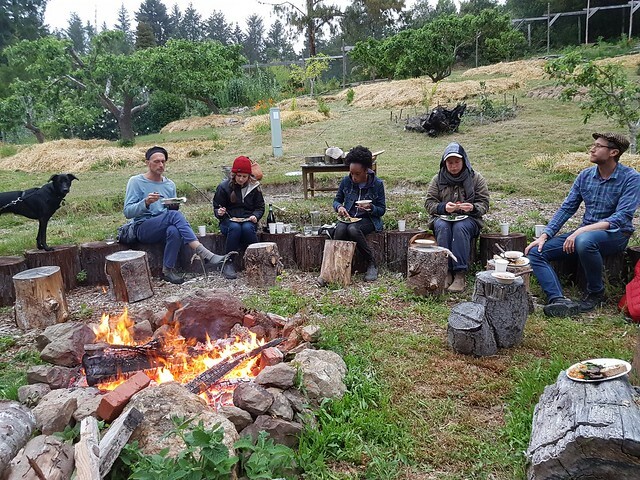 They learned how to build their own homes and grow their own food while living communally, exploring Native American rituals, and practicing consensus decision-making”. Lucas makes his way up to the communal cottage. Salmon Creek Farm was established in 1971. Luckily for us, one of the original communards lives next door. She and her partner came for dinner one evening and painted a picture of life on the land when this valiant group arrived with very little and built a communal life for themselves. It must have been extremely tough and rudimentary, yet the cottages speak of a wonderful creativity and ingenuity. People come and go at Salmon Creek Farm, with Fritz as the only permanent resident. It has the sense of a ‘retreat’, offering people the opportunity to escape the city to recharge, while participating in the life of the farm. We shared our time there with Alex, Dionne and Nissa, three lovely young women artists who all reside in the Oakland area of San Francisco. Meals were shared in the communal dwelling and each day began with some reciprocal work on the farm, whether it was rebuilding walking paths or weeding the extensive fruit and vegetable garden. Evenings were spent eating dinner outdoors by a campfire, with Fritz holding court and his beloved dog working his way into our hearts. People are drawn there also by the schedule of workshops offered throughout the year at the farm. We participated in a botanic research project run by Alex, who has spent quite a bit of time there helping to establish the new Salmon Creek Farm. 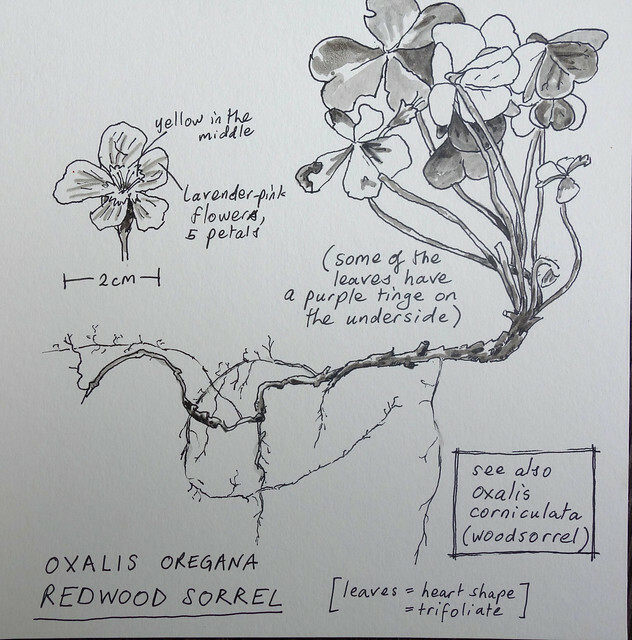 This was a real treat for us, not only because we learnt something of the species small and large growing in the forest, but also because it gave us the opportunity to spend some quiet time doing botanical drawings. Nissa, Alex, Dionne, Lucas and I sat together at a long table in the communal dwelling, surrounded by plant specimens, books, drawing equipment and laptops, happily researching and drawing our specimens. The long-term objective of this project is to build a botanical guidebook of Salmon Creek Farm. This activity was quite inspirational for us, as we have taken the idea forward to our exhibition at Artspace, Mackay, which opens on the 2nd November. Our stay at Salmon Creek Farm was a reminder of how diverse art really is – the farm itself is now Fritz Haeg’s art practice. 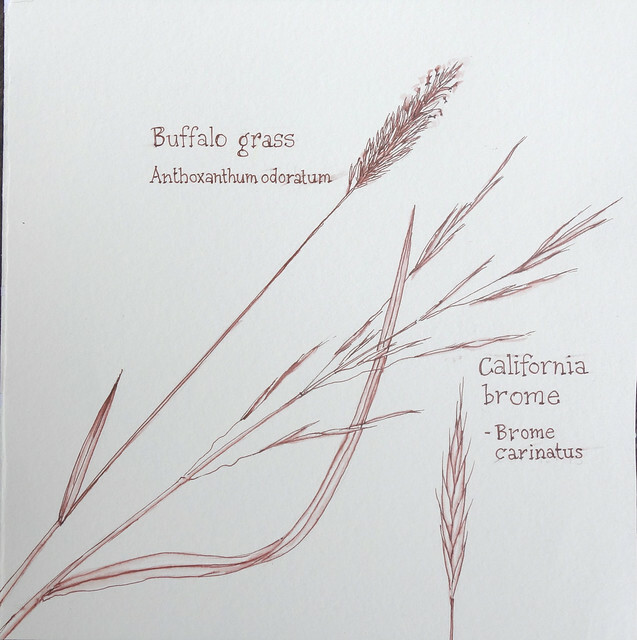 I love those botanical drawings – the buffalo grass reminded me of Bruce Pascoe talking lovingly of kangaroo grass. Can you make bread with buffalo grass?